*This post contains a paid for advertorial by Toppbox, however, all opinions are my own. The world of subscription boxes is bigger and bigger every day. In my opinion, this is great for us customers because we have a huge variety of options to choose from. Moreover, they are also a fantastic platform for small companies to be discovered and to present their products to new buyers. The best kind of subscription box for me is a grooming box, mainly because I’ve discovered my favourite products thanks to them. 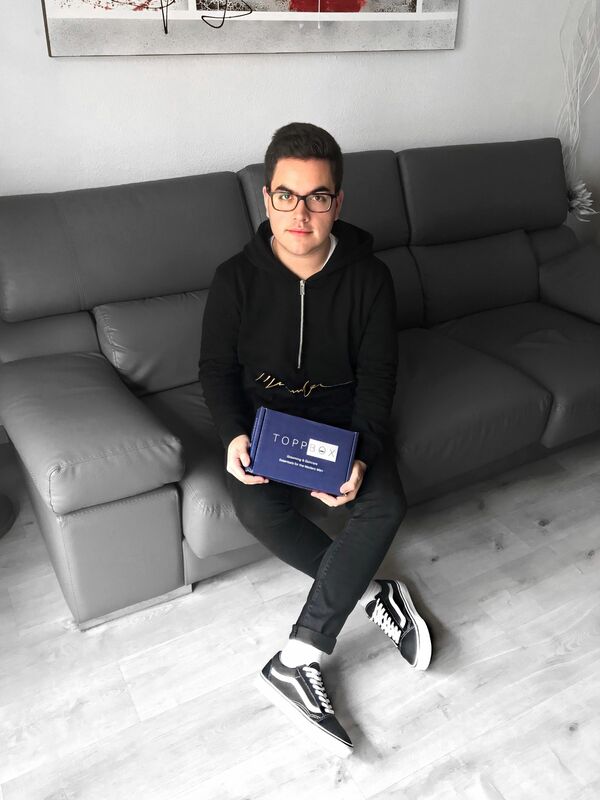 Today I am going to introduce you to one of them, which is called Toppbox. One of the best things about Toppbox is that it offers the possibility of buying a subscription box for yourself or for someone else. You can even personalise it so that it suits you or the other person better. Moreover, you don’t need to get one every month if you know you are not going to use all the products. You can be subscribed and receive a box every two or three months. They are very affordable as well, as they only cost £19 plus shipping even though there is a £50-70 value in each one. This is by far my favourite product of this box. To be honest, I had never used any foot exfoliant in the past and I never thought it was a thing. I actually felt like my feet were quite soft and smooth already, but I was wrong. After using this exfoliant your feet look and feel amazing, as if they were baby’s feet. Obviously, you need to moisturise them afterwards so that they are not too dry. What I love the most about this product is that it smells delicious. In fact, it contains cocoa, which is why I would definitely eat it – don’t do it though. In my opinion, it is important to always have a face wash and use it regularly to help you get rid of excess oils. Even though I can’t say this is my favourite one ever, it is a really good one. It contains Aloe Barbadensis Leaf Juice, which is very good at removing excess oils, dirt and debris. However, it nourishes the skin at the same time making it feel refreshed and soft. It can also help you removing dead skin because it contains citric acid, which works quite well for that. Don’t worry about this though, as it is suitable for sensitive skin anyway. I must admit that I do not use too many serums. The main reason for this is because I am too lazy and I try to reduce my skincare routine to the essentials. However, I do think they are important to help us take care of our skin. Thanks to Toppbox, I have discovered one of my new favourites. S5 Skincare Purify Serum is perfect to tackle any of those blemishes that may appear all over your face. It is supposed to reduce them by 42% over a period of 56 days, although you can appreciate the effects instantly. This serum also help you reduce your pore size and improve the overall condition of the skin. I am very picky with fragrances and that’s probably why I am not the biggest fan of this one. What I don’t like about it is the woody smell. I know there are lots of people that love it, but I can’t stand it on me. However, I do think it is a good fragrance and the woody smell is not that horrible to be honest. The scent and the packaging remind me of a British gentleman, although it is supposed to be a unisex fragrance. If I had to choose an occasion to wear it, it would probably be a casual dinner with friends or going out for some drinks. Even though I’m normally rushing in the mornings, I do love taking my time in the shower. As you can’t use bath bombs or bubbles as you do in the bath, body washes are the best way to improve the overall experience. It is important for me that the body wash has a very nice scent and that it makes me feel clean and refreshed. This one in particular is very good at the second thing, but I am not the biggest fan of its scent. It may be because I am very picky or just because it is not the right scent for me. However, it works perfectly and I am still going to use it for those times that I can’t spend more than two minutes in the shower. If I had to choose between tea and coffee, I would definitely go for the first one. For this reason, I was excited to try the infusion included in the box. To be honest, infusions are not my go to because I normally prefer a high quality tea. However, I was surprised when I tried this one because it was actually pretty nice. Apparently, it is good for you because it is supposed to help you stay away of colds. I don’t know if it works, but I think I am going to buy a box and try because I get ill quite often. I would definitely recommend getting one of these Toppbox boxes for yourself or for a friend. Again, it’s a great way to discover new products and they are very affordable considering all the products that you get in them. However, I personally wouldn’t get one each month because I would probably end up with a huge pile of unused grooming products. This is why the every two or three months options are more realistic for me. Love this box! The Christopher Courtney scrub is amazing!